Greenfingers is quite the impressive garden retailer. We know they may have a funny sounding name, but one of their aims to have everything you would need for a garden and that they are very serious about. They of course have plenty of garden buildings like sheds, summerhouses and greenhouses, but they also have an insane amount of other garden products. We are talking things to help your garden grow, plants, food, lighting. If it can go in your garden then more than likely you are going to find it here! With so much stock it is clear why Greenfingers voucher codes is such a popular search term on Google as so many people are looking to make their money go further. Making sure you find the right Greenfingers deal is what this is all about. We are going to make sure that the deals you see are legit and that you do not have your time wasted by sites that claim to have magic Greenfingers discount codes that were made by a leprechaun as he offers you his pot of gold! It can be so hard to find legit ways to save money, but here at WhatShed that is what we are going to do! We know that if you have come to this page you are looking for a discount code for Greenfingers, as we explain further up Greenfingers dont often issue discount code. As such we thought you might like to see what are some of the best discounts that are currently on offer from other garden building retailers. The best tips that 90% of people who SAVE money at Greenfingers use! Now this is the section where we give you the best Greenfingers deals that we can find. Actually what we have just below are not just deals or links to the special offers that Greenfingers may have running, we also have some ways that you guys can keep on top of when sales are starting, when an item is on special offer. In general our aim here is to make sure you are as well informed as possible before you hit that buy it now button and we do it all without the need of coupons, codes, vouchers or prayers to higher powers. 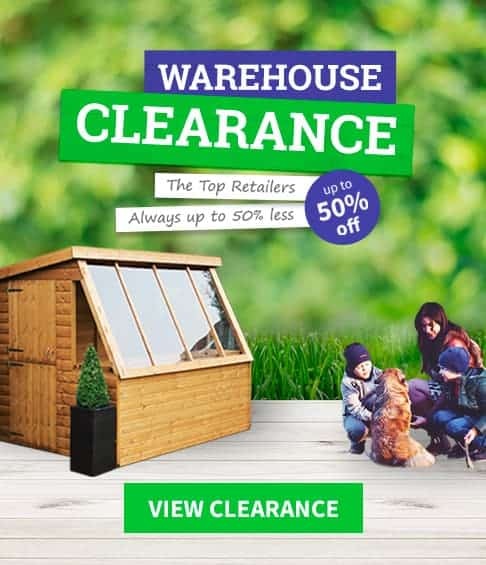 You can get a great bargain in their clearance section: The first place we are going to send you on your epic quest to get the best Greenfingers deal possible is to their clearance section. Now as they sell pretty much everything here, you are going to have to check the boxes at the side or just roll your sleeves up and really dig through all the things they have. Greenfingers always seem to be getting in new lines, but with that means that certain lines get discontinued so what they have in their clearance sale on quite a few occasions is a once it is gone it is gone type of deal. So if they do have something here that catches your eye do not dilly dally and pull the trigger on it before it is gone! Score a great deal at their flash sale: What, one site has two sales sections? That is right. As well as the items they are trying to get rid of, Greenfingers quite often will have some kind of crazy discount on a product. Again like we said before they do sell a bit of everything here, so there is no guarantee that there is always going to be a shed or some other kind of garden building in their flash sale, but it certainly does not hurt to look. As of us writing this they have 20% off this pretty awesome looking gazebo that would finish off a garden very nicely. One week you could come here and there be no garden buildings at all, but then the next week it could be nothing but sheds! You never know what their flash sale is going to throw your way. Keep up to date on their latest deals via Facebook: Here we have a way where if there is ever a Greenfingers voucher code, you will find out about it. Liking the Greenfingers Facebook page is not just a good idea because you will see if they do have any kind of discount codes going on, but as their flash sales can literally come out of nowhere, when one does happen you will find out about it right away. Nothing worse than finding out you missed an awesome sale. Well like them on Facebook, after you have liked about 75 pictures of your friends kids of course and then you will be bang up to date with the latest Greenfingers deals. TIP FOUR: They have a specific garden buildings sale! What, they have a third sales section? : Ok we have to admit this is getting a bit crazy now. This is a third sales section on the Greenfingers site, but this one is just all about garden buildings. Now you may not get the wild and crazy deals that you do with their flash or clearance sale, but they always have sheds, greenhouses, summerhouses and all other kinds of garden buildings on sale in here. So if you do want to make your money go a little bit further, then be sure to look in here. Have a look at their finance options: We know that this tip is not for everyone, but if you do see a larger structure that you just love and want, but know it would take you years to save up for, then you can actually spread the cost with their finance options. They will of course charge you interest, but when you have a close look at their rates they are actually not out of line at all. Plus paying it off monthly could be just what you need to get that amazing shed or summerhouse in your garden. A round-up of all the current Greenfingers voucher codes we found online. We have had a real good look at ways that you can really make sure you get the perfect Greenfingers deal for you. The ways we showed you were all current deals and tips that can lead to you getting a great deal without a lot of hassle. Hassle is what you get when you look at one of these sites that claim to have amazing Greenfingers discount codes, coupon codes to special offers. You can spend a good hour looking around online for a way to save a couple of pounds only to then realise you are no better off at all! That is what we are trying to help you avoid here. We are going to show you the sites that claim to be able to save you money and then tell you exactly why they do not. We put on our Batman cowl that we have in the office and did some real detective work. We have looked at what the most common money saving sites are when it comes to people looking for Greenfingers special offers. We used Google and made sure to only use actual terms that people would use such as: Greenfingers Direct Voucher Codes, Greenfingers Coupon code, Greenfingers Current Discounts, Greenfingers Current Voucher Codes and Greenfingers Sale. The sites we are going to talk about all popped up when we used these terms. Finding Greenfingers garden building special offers is tough! We said earlier on that we really are blown away by the amount of different things that Greenfingers offer. You can pretty get your whole garden set up from these guys and not have to leave your house to do so. Well you will to set it up, but you know what we mean. The thing is while there are many sites claiming to have all kinds of Greenfingers deals. The fact we have not seen a single site that is dedicated to Greenfingers as a garden building retailer. So that means you are going to have to look through, in some cases hundreds of random deals in the hope you find one for a shed! What they claim? Fyvor is a kind of odd site for us to talk about. You see unlike some of the other sites claiming to offer Greenfingers voucher codes, Fyvor do not have any big long intro they just get straight into their list of deals and offers. Rather than have a banner telling you they are all valid, each individual deal has its own expiration date. What We Found? There are quite lot of Greenfingers discount codes for you to go through here and like we suspected most of these are not for garden buildings. Now we had a real good look at these deals and most of them are actually the same deals that are going on right now on the Greenfingers site. So you can look through all the deals on here, click their link and then go to the Greenfingers site. Or you can do the smart thing and just go direct to the Greenfingers site. The time you save by not going to Fyvor can be used to do something productive like grab a Coke from the fridge. What they claim? My Voucher Codes claim that they have current Greenfingers special offers. They give you a little bit of insight about Greenfingers as a retailer and then they let you see what they class as the best deals just below. What We Found? We like how they have the offers near the top of the page and then have the information about Greenfingers at the bottom. They do not have a ton of deals and the ones that they do have are actually current, but by coming here before you go to Greenfingers is not going to save you a penny. For example, one of the Greenfingers special offers they have listed is 63% Off Garden Furniture, which when you click you are just taken to the garden furniture section of the Greenfingers site. This is just a total waste of your time. What they claim? Ah, UK Promo Pro, we meet again. We have had some issues with this money saving site in the past and once again those same problems are relevant here. Ok so to start with, UK Promo Pro do go out of their way to let you know that they have current and valid Greenfingers discount codes. They then have a section where they show you what these are. What We Found? We found the exact same deals that you can find on the three sales sections that are on the Greenfingers site. So why you would need these as a middle man is beyond us. Anyway we could forgive them for having just boring and standard links that will not save you any money, but the one thing that we really do not like is the way they have quite a large selection of codes that they themselves say are expired. Why they keep these here we have no idea, but they then also say that they might still work. We have put together many voucher guides and never once has anyone at WhatShed come across an expired code that somehow still works. What they claim? 360 Voucher Codes have a fairly decent selection of Greenfingers voucher codes. One thing that this site does which is actually quite uncommon, is that they do not just tell you that these are current for whatever month you just so happen to be on their website. They do also tell you the exact date that the page was last updated. To be fair to the folks at 360 Voucher Codes this is something we like to see. What We Found? Now let us start by saying that the deals we saw here, even though none of them were for sheds or other garden buildings, were Greenfingers deals that we know for a fact are still running. So far so good, right? Well yes in theory, but you have to ask yourself what do you actually get out of coming to 360 Voucher Codes before you go to Greenfingers? The answer really is nothing as you will not save any more money by coming here first. What they claim? Revouchers have possibly the smallest selection of Greenfingers discount codes, deals, offers or whatever you want to call them. They claim that each of the deals they have has a certain percentage of success. What We Found? We only found three deals on here with one having 99% success rate and the lowest one being 73%. These are just links to the sales that are going on at Greenfingers. There is no special offer here that gives you a little bit more money off. The thing that this site does which we do not like is have suggestions for other retailers. It comes across like they are just trying to get you to click other links on their site so they can make a couple extra pounds. What they claim? Coupon Chloe is not really making any boastful claims that they are the best in the universe when it comes to Greenfingers discount codes. This is actually quite refreshing as there seems to be a lot of sites who have the best codes out there. Right at the bottom of the list they do say that they will have more code soon, so it does seem like they are keeping an eye on things and will update this page. What We Found? Now we will start by being fair because we always like to be as fair as possible here at WhatShed. Now all of the Greenfingers deals that we clicked on here are valid. We did not click on a single one and have there be a problem. Now before you go running here, let us tell you that while the links here are good, they will not actually save you any money at all. You see the links or deals if you prefer that they have are just the same deals that are already listed on the Greenfingers site. What they claim? Ok Vouchers has quite a busy website. There is links and writing and all kinds of stuff going on all over it. Once you get your eyes to focus on the actual Greenfingers section, you will notice that they do say that they have Greenfingers voucher codes that are valid for the month it is. So we are writing this guide in June and June is the month they claim their deals are for. What We Found? We found the same links that we have seen on most of the other sites on this list. Now the weird thing about the Greenfingers deals that are listed on Ok Vouchers is that it is almost like they went to another voucher site and just randomly picked a few codes and then shoved them here. We will say that the deals they have listed are current, but again you will not be saving any money by clicking on them so do not waste your time. What they claim? Voucher Wing do a pretty good job in explaining what kind of retailer Greenfingers are so we give them credit for that, but apart from this there is not really a whole lot going on here. They do not make claims that the Greenfingers deals they have are valid, but they do at least ask people to tell them if the codes they have listed no longer work. What We Found? We only found three Greenfingers special offers listed on here and each one took us to the Greenfingers homepage. This is one of those sites that really is harmless, but at the same time it is a huge waste of time. Just think what else you could do with the five minutes this site wastes. You could have gone and got another Mars bar out of the cupboard and then just gone to Greenfingers directly! What they claim? There are actually a pretty good amount of Greenfingers special offers listed on Voucher Slug. They say that these are valid for the current month and they also make the claim that they update their codes, deals and offers on a daily basis. What We Found? Links to the homepage! Seriously, Greenfingers have three different sales sections on their site how hard is it for Voucher Slug to at least link to one of those instead of the homepage all the time. It just makes coming here and absolutely pointless thing for you to do as you will not save any money. Also they have a section at the bottom with old codes and deals, which is something we really hate to see as it just gives people more pointless links to click. What they claim? Promo Vouchers are a site who do not try and wow you by saying they are the best thing going. As a matter of fact their site is a lot more laid back that many of the others that have made this list. What We Found? We had a real good look and we mean a real good look at this site. They do actually have a fairly large selection of Greenfingers voucher codes, deals and offers. Now we clicked on nearly all of them and it was the same thing time and time again – all the links just take you to the homepage. Now most of the deals that they have listed are actually deals which are happening right now, so we do not understand why they do not take you there with their links. We are not saying that if they did it would make coming here worthwhile, but at least it would make sense. If you really want the best Greenfingers deals then just go to them directly.